Thank you, Nick for you kind words in my pictures. You were generous. I take all my pictures will all passion an I put a lot of me in to it. I'm happy that someone pays attention to it. Thank you again. Simply suggestive in the best meaning of the word! Thank you very much Rebecca... really! Goncalo, I have been looking thru' your portfolio and you have such impressive work. This image stuck out to me. 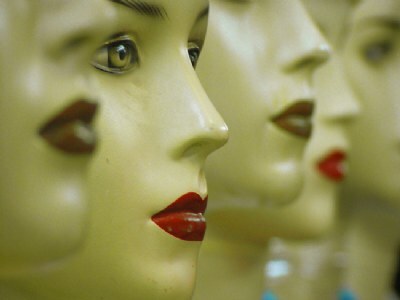 I love your use of dof and the placement of the mannequins, up down up down, fantastic! The crop of this shot is perfect and I love all aspects of it. Great work, excellent presentation. I'm not used to this kind of compliments. You're very welcome, Goncalo. If you found them this way, it shows what a good eye you have. If you set them up this way, it shows what an artisit you are. Either way, it is a fabulous photo! That's very kind of ou Dave. Thank you! Excellent, Goncalo. Not only do you have a repetitious pattern here but the various levels of the mannequins are situated at the best, with the lipstick/non-lipstick not only offset height-wise but staggered as well. Surpreised this didn't capture the attention of a judge along the way. This is another impressive photo. wonderful photo! your portfolio is very interesting. Thank you Katy! That's so nice of you! Beautiful composition and tones. Good choice of dof. congratulations. beautiful, stands out from the rest so much, colour and depth of field really make the image......i really love it! wow! so creative with an amazing title! i like the title very much! Excelente uso de la DOF y la composición.